Because Eleonora’s dream is a Normal Life…and nothing is more normal than going n Holiday with the family! Because architectural barriers are truly a small obstacle compared to the barriers that separate people from others… and we would like to address this last taboo. It’s been the work of our family for 4 generations to run a hotel. In 2006, after thinking about the market, we opened a rehabilitation and physical therapy centre inside our Spa Resort. Then we demolished the architectural barriers, inside the wellness centre, in the access area to the swimming pools and inside the bedrooms of the hotel; our objective was once again to develop new market areas. Today, after all we have been through, and after all we received during our difficult time, we have come to realize that there are other barriers which are much more difficult to demolish than the architectural ones: the barriers that separate people! 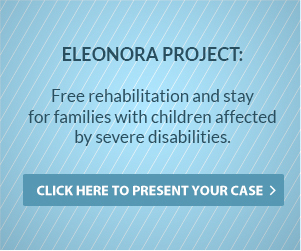 Project Eleonora was born from the collaboration between Ermitage Bel Air Medical Hotel and the association Eleonora’s dream. It enables children and their families to experience a pleasant holiday in a safe and protected, non-hospitalized environment, where they feel welcome and not discriminated against. When possible, useful and consistent with their psychological and physical conditions, people can also enjoy rehabilitation and physical therapy services in addition to the hotel services, as well as individual physical therapy in thermal water aided by qualified staff. The association provides a highly accessible suite which is offered at no charge by Hotel Ermitage all year long. Room 21 is therefore always available for disabled children affected by serious genetic diseases and their families. ALL HOTEL AND HEALTH SERVICES ARE PROVIDED AND GUARANTEED by the association Eleonora’s dream and by Ermitage Bel Air Medical Hotel COMPLETELY FREE OF CHARGE! Allow families and patients to experience a pleasant holiday together! Children and families directly recommended by the Pediatric Hospice in Padua and the Department of Neuroscience of the University of Padua, are automatically eligible for the project. The presented diseases can benefit from the physical therapy services available in the structure. In the event that two or more requests should coincide, the association has the right to give priority to the more serious cases on the basis of given information.